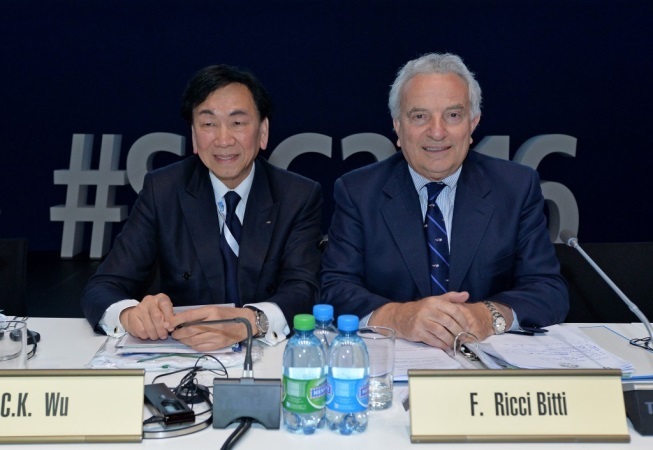 （InsidetheGames April 19, 2016）　Francesco Ricci Bitti was unanimously re-elected President of the Association of Summer Olympic International Federations (ASOIF) here at today's General Assembly. The body's vice-president CK Wu, the Taiwanese head of the International Boxing Association (AIBA), was also proposed to continue serving as the ASOIF representative on the Executive Board of the International Olympic Committee (IOC). Ricci Bitti was the only candidate to stand in elections held at the end of today's meeting. He received unanimous support from all 28 member federations. The 74-year-old Italian has been leading the organisation since 2013, when he succeeded Switzerland's Denis Oswald, who had held the position for 13 years. Ricci Bitti is also Honorary Life President of the International Tennis Federation (ITF), an organisation he had led between 1999 and 2015 before stepping down last year to be replaced by American David Haggerty. He is also a member of the International Olympic Committee (IOC) Coordination Commissions for Rio 2016 and Tokyo 2020. No longer being ITF President will allow him more time to focus on his ASOIF responsibilities, Ricci Bitti said. "I can assure you all my commitment to continue," he said. "I want to thank all of you for all your support. "We are going to have a very challenging time. "We have a responsibility to make the Olympic Movement better. "It is our vision to be close to the IOC because the sport movement is IOC centric." Wu, meanwhile, will be officially confirmed as returning to the IOC Executive Board during August's IOC Session in Rio de Janeiro. Ricci Bitti is ineligible to serve as he has passed the IOC age limit of 70. He hailed ASOIF projects on good governance and anti-doping as priorities for his second term following discussion during today's meeting. A new assessment tool was approved today during the meeting, with several IFs having already started using it and others expected to follow suit "very soon". It comes with aims to "help federations to protect the integrity of their organisation and sport in the best way possible” following the recent scandals involving the likes of FIFA and the International Association of Athletics Federations (IAAF). Research exploring current anti-doping activities and processes of the ASOIF members were also discussed, as well as related expenditure and current IF practices surrounding athletes’ health and safety. First results are expected to be available in June. This will deliver "valuable input" to the ongoing discussions about the potential creation of an independent body for testing, it is hoped.